4Front is a leading retail and brand development company in the U.S. cannabis sector. It has developed a national platform that consists of a multi-state footprint, including its Mission-branded retail operations, and a far-reaching network of partnership relationships. Led by a group of professionals with experience in finance, real estate, manufacturing, and multi-location retail and hospitality operations, 4Front has invested heavily to assemble a comprehensive collection of management skills and hands-on operating expertise that can support the rapid operational growth opportunity being afforded by the increased legalization of cannabis across the United States, as well as internationally. Originally founded as a consulting firm, 4Front is designed from the ground up to successfully navigate disparate and complex regulated markets. Since 2011, it has quietly racked up successes while others have sought the limelight. To date, the 4Front team has obtained more than 60 operating licenses for partners in some of the country’s most competitive state-legal markets, including Massachusetts, Maryland, and Pennsylvania. Beginning in 2015, 4Front began to evolve its business model beyond just consulting. 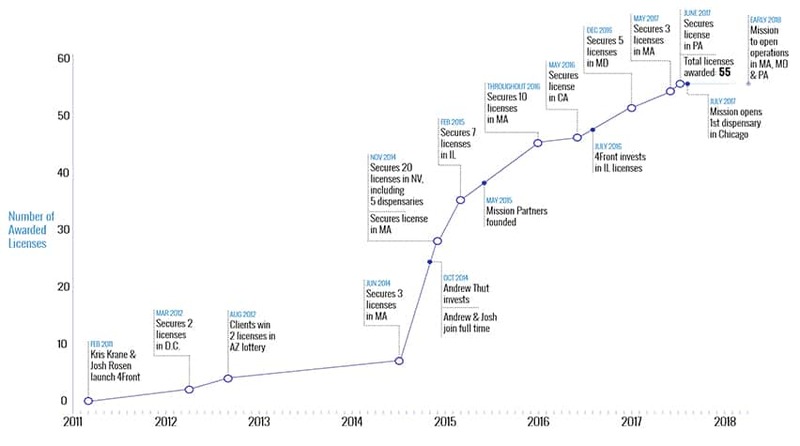 It leveraged its team’s expertise at winning licenses and navigating disparate regulatory jurisdictions—and supplemented it with new team members from the finance, real estate, and multi-state retail and hospitality industries—to begin obtaining controlling stakes in scarce operating licenses in attractive, often new, medical markets via de novo opportunities and acquisition. 4Front currently owns, operates or manages five cannabis retail operations in Illinois, Maryland, Massachusetts and Pennsylvania and three cultivation, processing and dispensary operations in Massachusetts and Illinois. 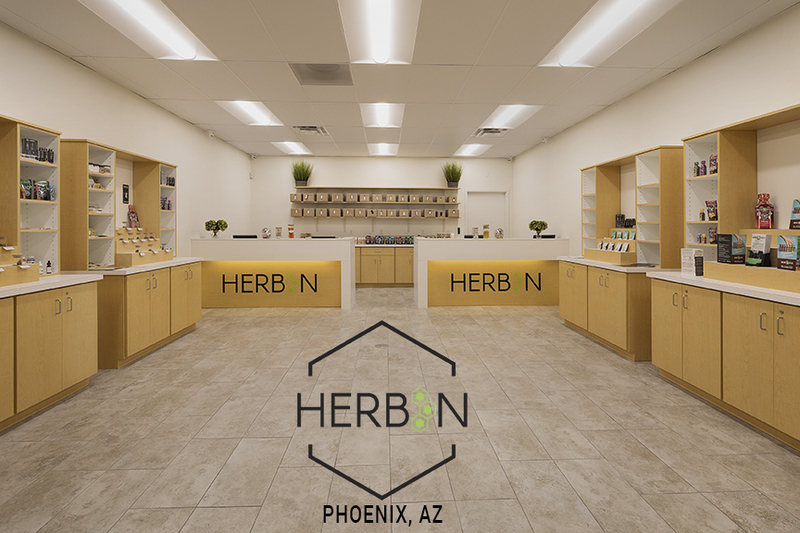 The company has also closed acquired vertically integrated operator Healthy Pharms in Massachusetts and the manager of vertically integrated license holder Greens Goddess in Arizona. 4Front operates its dispensaries in Illinois, Maryland, and Pennsylvania under the Mission brand, while two locations in Massachusetts operate under a legacy brand as a result of a recent acquisition of a vertically integrated operator, though will eventually transition to the Mission brand. 4Front also has licenses or licensing agreements in place that will enable it to open several more Mission-branded dispensaries in Massachusetts, Maryland, and Pennsylvania in the first part of 2019. Mission embodies the best practices and training IP, including a week-long management training program, developed by the 4Front team over several years operating as consultants in the industry, coupled with team members’ expertise honed at companies like Sweetgreen, Hillstone Restaurant Group, and Pulte Homes. With Mission, 4Front has developed a customer-centric, scalable model for operating cannabis retail operations in a safe, secure, and professional manner. 4Front leadership holds 36% ownership and has raised more than $68mm in equity from both management and outside investors. Josh provided seed capital to Kris Krane to form 4Front Advisors in 2011 and joined as a full-time team member in 2014 when 4Front Ventures was formed. Previously, he spent 13 years as an equity analyst and portfolio manager in the financial services industry, during which time he became one of the youngest vice presidents in Credit Suisse’s history. Josh moved into private equity in 2008 because he wanted to have a more meaningful impact on companies. Having founded 4Front Advisors in 2011, Kris now serves as president of 4Front Ventures. Prior to forming 4Front, Kris served as director of client services for CannBe, a pioneer in developing best practices within the medical cannabis industry. Kris has dedicated his career to reforming the nation’s misguided drug policies, having served as associate director of NORML from 2000-2005 and executive director of Students for Sensible Drug Policy from 2006-2009. He currently serves on the NCIA board of directors. Andrew joined 4Front in 2014 and has immersed himself over the past three years in every facet of the medical cannabis industry. 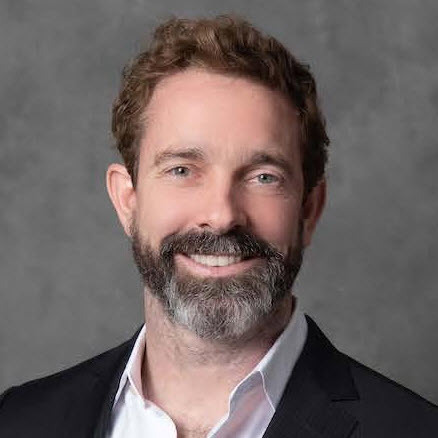 Prior to his role at 4Front, Andrew was managing director of the BlackRock Small Cap Growth Fund at BlackRock Advisors LLC. During his 11-year involvement, the $2 billion fund ranked in the top five percent of all domestic small cap growth funds. He also had past stints at MFS Investment Management and BT Alex Brown. Richard has more than two decades of creative leadership and brand-development experience. He is a former SVP and Creative Director at Williams-Sonoma and VP of Marketing at The Body Shop. He’s also led marketing efforts, from concept to implementation, at Vosges Haut-Chocolat and Bed Bath & Beyond. He joined 4Front in 2018. Don is responsible for the retail development and roll-out of dispensaries that 4Front either controls or manages for partners. Don is an Army vet with U.S. and overseas assignments under his belt. 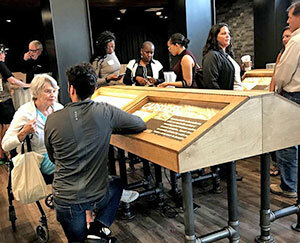 After the military, Don applied his team-building experience to the retail & hospitality sector, where he helped best-in-class brands like Hillstone Restaurants, Starwood, and Le Pain Quotidien develop their cultures. As former VP of Ops for Sweetgreen, Don helped expand from 1 location to 30. He joined 4Front in early 2014. Glenn is an experienced retail executive. His previous experience includes serving as the Vice President of Buying at Trader Joe’s. Now, he is President of Mission, 4Front’s network of branded retail operations. Glenn also teaches MBA-level classes on business strategy and leadership at Lake Forest Graduate School of Management in Chicago.